Rockworld Water Features Water Feature HOW To? Here we try to answer some of the most common and also the more technical questions involved in water feature selection, design, construction and maintenance. If you have any questions or require any information please don't hesitate to contact us. Don't forget to check out our Frequently Asked Questions FAQ for more information. We also have a fantastic download section where you choose from a variety of catalogues with lots of helpful information. Do I need a water supply for my water feature? 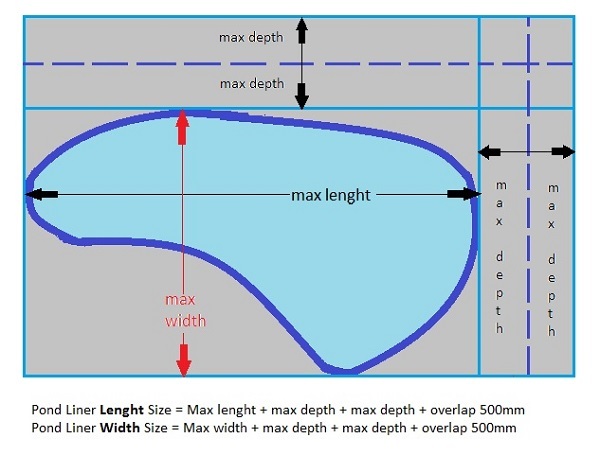 How to calculate pond liner size? How to calculate liner area ? How do I calculate the volume of water in my pond ? What is "head height" when referring to pumps? How to calculate required flow rate for a waterfall ? Do I need an ultra violet filtration system for my pond? How long can I turn my filter pump off for? How to create a water feature in a tub or barrel? Do I need a water supply for my water feature? The quick answer is no, because once the tank/pond/pool/reservoir is filled with water, then this same water is continually re-circulated. During warm weather you may need to top up with water. So rather than having a permanent water supply plumbed to your water feature, you can simply top up as required with a hose. Having said that is useful to have an automatic water top up system to ensure the water level is maintained. Such a system only adds water as required. Typically we add electronic level control to all commercial water features to ensure water levels are maintained automatically but if you are prepared to occasionally top up with a garden hose then there is no need for an automatic top up system. The top up system can be as simple as a ballcock (float switch) arrangement (similar to an attic tank refill) or an automated system using a sensor, control panel and solenoid valve. Whilst automated systems cost more they have several advantages over a ballcock system. How to calculate pond liner size? Pond liner will have to be large enough to go up and down both sides of the pond as well allowing for an overlap all around. We need to calculate the length of liner and the width of liner. The calculation for overall length is Length + twice depth + 50cm and the calculation for overall width is Width + twice depth + 50cm . For example 3 meter long pond which is 2 meters wide and 0.5 meters deep will have an overall length of 3 + (2 x 0.5) + 0.5 = 3+1+0.5 =4.5 meters. The overall width is 2 + (2 x 0.5) + 0.5 = 2+1+0.5 = 3.5 meters. So we need a pond liner that is at least 4.5 meters by 3.5 meters. How to calculate liner area ? Liner area is overall width multiplied by overall length. So a liner 4 meters long and 3 meters wide is 12 square meters in area. ( 4 x 3 =12). Similarly a liner 4,5m by 3.5m = 15.75 square meters. It's worth keeping all measurements in metric system rather that imperial (feet and inches) for simplicity and accuracy. What is "head height" when referring to pumps? Head height is the maximum height a pump will pump water to. Basically it is the point where the pump stops pushing out water or no flow point. The higher water has to be pushed upwards through a pipe the less water flows. When calculating head height for a waterfall or stream the head height is the vertical distance from the top of the water in pond to the top of the waterfall (not from the bottom of pond). We have lots of graphs with our pumps which show the various flow rates at different head heights. Do I need an ultra violet filtration system for my pond? That's a question that often causes confusion amongst many people and even some experts. The answer is yes, if you want clear healthy water. Water plants will certainly help keep pond water clean, if they cover enough of the water surface, meaning at least a third of the water surface. The problem with plants only is that they grow at different rates and thus at some stages of the year coverage will be less than required for some plants which allows more aggressive algae to flourish. A pond is a mini eco system which needs to be kept in balance. Anyone who has had a properly sized UV filtration system, which is maintained regularly will tell you how great a job they do. A UV filter system can always be added later if you want to try without one, just allow for locating it and power supply at design stage. How long can I turn my filter pump off for? Never is the short answer, a filtration system needs to run 24 x 7 for most beneficial results. Filtration pumps should not be turned off or placed on a timer. Why you ask, here's the science, nothing complicated but worth knowing. Inside your filter there are beneficial aerobic bacteria colonies. This beneficial bacteria do the work of converting the ammonia produced by your fish into nitrites and then into nitrates. As your fish need oxygen, food and minerals to survive so to do this aerobic bacteria in your filter box. It is estimated that this bacteria can die of in as little as 4 hours. They grow back but putting your pond through this constant cycle of death and rebirth is hard on the ponds ecosystem and causes poor water quality. Even if the bacteria don't die, each time you turn of your pump they start to go anaerobic. So when the pumps is turned back on the resultant surge of water though your filter washes out debris into the pond often with the accompanying smell. So it is best to leave your filter pump running permanently and only turning off for brief moments of necessary cleaning. That's another reason for choosing a reliable low energy pump such as the Oase Aquamax Eco Premium range...their initial cost is quickly recouped due to their low energy consumption. The 12,000, 16,000 and 20,000 range of aquamax eco premium pumps also have SFC seasonal flow control, which means that during winter when low water temperatures prevent most plant life growing, you can flick the SFC switch on the pump to reduce power consumption by up to 50%. How deep should a pond be for Koi? Koi ponds should be at least 1 meter (just over 3 feet ) deep as a minimum. Though typically all koi pond we build are 1.5 meters deep. You can get away with shallower pond for goldfish as they tend to be hardier than Koi. Deeper ponds make it more difficult for Herons to stand in so they have less chance of taking your fish. Also as sunlight tend to effect 100% of the top 600mm of water, the extra depth of water gives a more chance for stable water conditions. As deeper water also increases the volume of water in your pond, a volume is your friend, you benefit from more stable water without taking up a larger footprint of ground. For koi pond we usually don't have any shallow areas of water or at the most limit them to one end only. How much water do I need for a koi pond? Typically 1000 litres per fish for Koi. Usually Koi ponds are a minimum of 6000 litres. For most people a 1m depth is sufficient , but if you really want your Koi fish to grow as large as possible we recommend 1.5m depth. Of course a goldfish pond can be as shallow as 400mm but typically at least 600mm. What size pipe do I need for a waterfall or stream? The larger the better, typically 1 1/2" (inch and a half) internal diameter. Larger hoses allow more water volume to flow than narrower hoses. Sharp bends in pipe work restrict flow and should be avoided, and hose lengths should be kept to the minimum. It's all down to friction loss, the loss of energy or head height that occurs in a pipe due to the viscous effect caused by the inner surface of the pipe. How to add value to your home investment with a natural pond and waterfall? Like other home improvements, the term “investment” relates to how much personal pleasure you receive (both visual & sound in this case), not just how much something costs. But for the sake of costs, a beautiful, natural looking, real rock water feature will return most, if not more than what you financially invested in having it constructed. 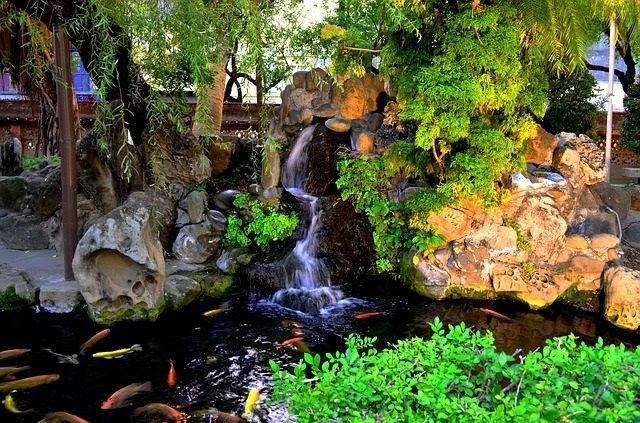 A natural rock pond & waterfall, will get more and more breathtakingly beautiful with each year every year as the surrounding plants mature, pond plants and lily pads spread and bloom beautiful flowers. How to save electricity costs when running a water feature? Choose a pump that is correctly sized for the work it has to do. There is no point getting a massively over sized pump that will cost more to run than the correctly sized pump. Main thing you need to know is for what purpose you want the pump , e.g. for a fountain or waterfall or filtration system. Then you need to know how high the water needs to flow or what volume of water you want at a specific height. When we know these figures we can compare charts to see which is the lowest energy consumption (watts) for our needs. All our pumps are extremely low energy consumption and some of our Oase Aquamax eco premium pumps have a switch for reducing energy use by up to 30 % when less flow is required in winter months. So a correctly sized low energy pump will quickly pay for itself over its lifetime compared to many cheaper standard pumps. Basically even though the initial cost, or capital cost as often referred to maybe higher the running costs are cheaper making the overall lifetime cost lower. How much does it cost to run a waterfall? It all depends on size, for example a 2 feet (600mm) wide waterfall at about 4 feet (1200mm) high , with a good flow of water over the waterfall, running 24 hours per day, 7 days a weeks will cost about €8.50 per month on electricity costs. For this example we have chosen the Oase aquamax eco premium 8000 pump. which uses an energy saving 65watts of electricity per hour. How can I save even more money running a waterfall? We build what is called a “pondless waterfall” where the water coming over the waterfall, or series of waterfalls disappears into a small bed of rock instead of a pond. This makes for an extremely low maintenance water feature that doesn’t have to run 24 hours a day. If it set to run on a timer for 3 hours a day, the electrical cost would be only be about €1 per month for a 600mm wide waterfall at 1200mm high. How do I ensure my pond will last as long as possible? Most important rule is using quality liners, our rubber EPDM liner has a life time guarantee and is 1mm thick (we don't supply or stock thinner versions or PVC liner). Adding a filtration system with a uv light will ensure your water quality remains clear and inviting. How can I extend my existing fish pond? Preparation is most important. You will need to move your fish to a temporary holding tank before any work starts. Filling the temporary holding tank with your pond water will reduce the stress your fish will suffer from the move. You will need to install a temporary filter system in your holding tank. It is best to have this holding tank in a position of least sunlight and cover with a net. Now work can commence on the extension. If a rubber liner pond it is possible to join a new section of liner to your existing liner (all joins must be thoroughly clean and dry). How can I choose between a raised or sunken pond? Both have their pros and cons. Generally above ground (raised ) ponds are harder to build but easier to maintain once built. A raised pond requires less digging, but needs strong walls for strength. Once built a raised pond provides a seating area, is harder to fall into and catches less ground debris. On the other hand it is harder to locate a good location for a raised pond and hide filtration equipment. Sometimes it the case that we combine both and build a partly sunken and partly raised pond. How can I light my beautiful water feature with effective night time lighting? Hopefully you have a spare switched circuit that you can connect a light to (for those designing a water feature it is always best to allow spare circuit for lights at initial design stage). If so then it is just a matter of choosing the type of lighting you want. All our lights are low voltage and submersible, you can choose from halogen bulbs or LED bulbs, different colours and even colour changing lights. We have even designed and installed programmable lighting with colour mood changing schemes that react to changing music. For those that don't have a spare circuit or don't want to put a new cable and internal switch in then we have the option of using a remote controlled FM3 unit (which takes one circuit in and give three circuits out that are each controlled by a remote control. Led lights are lower on energy consumption than halogen bulb, whilst halogen bulbs tend to give a softer deeper glow in water. All waterfeature lighting is low voltage and come with either 5m of cable for halogen fittings and 10m of cable with led fittings. Adding lights will be truly beneficial, been able to relax outside on a warm evening with the sound of water in the background, and a gentle light catching the moving water is a true pleasure. When moving water and light meet the effect is mesmerising. Underwater lights can also be used to illuminate from the edge of a pond so that the entire view is lit or concentrated on a feature you would like to draw attention to such as a fountain, bridge or waterfall. When submersible lights are used below water in a fish pond or wildlife pond you will be able to see into delicately glowing water and watch fish moving around at night. Lighting will definitely increase your enjoyment of aquascaping. If you want to do it the professional way you should use a special fitting called a Tradux which can also be used for concealing pipes. How to care for stainless steel water features? If you have a polished stainless steel water feature you should clean it regularly with a non abrasive cloth and water as abrasive polishes or cloths will scratch or mark polished surfaces. If you have a brush finished surface use a stainless steel cleaner , available from your local hardware store, and a soft cloth. How do I avoid any pipes or cables being seen around my pond? We have a special fitting called a Tradux which allows cables or pipes to pass through the side of your pond liner or pre formed pond. Everyone does not want to get involved in the “technicalities” of pump selection and we have a number of easy read tables which help you choose . However understandings more about your pump will actually help you understand the living, breathing ecosystem that lies beneath the surface of the water. This knowledge can help you solve complications before they arise. The purpose of the pump in relation to your pond’s ecosystem is important. Pumps and pipe work make up the circulatory system of a water feature. Your pump helps supply the pond ecosystem with necessary oxygen levels as well as keeping the water re-circulating. Sometimes just the range of available pumps can complicate the selection for all water gardeners. Pumps made specifically for water courses, streams and filtration systems are definitely the first priority. Watercourse and Filtration Pumps do not get blocked as easily as fountain pumps and this due to the large surface area of their intake cage as well as their ability to handle solids passing through them. Watts, is the electrical power used to operate your pump. The higher the watts the more power used and naturally higher flow rates require higher wattage. But importantly some pumps use very little power to achieve high flow rates, for instance cheap sump pumps may have a high flow rate but also a very high power consumption. We often find sump pumps can use 3 to 4 times the amount of electricity (watts) compared to water garden pumps. So once we know what flow rate we need we can compare the watts used to see which pump will be more efficient than the other. Good for the environment and saves you money on running costs. Max head height, is the maximum head height or shut-off height, the height the pump will flow vertically upwards before no water flows out. The higher a pump has to push water, the less water will come out. So some pumps will not work on a high waterfall because they are able to push the right amount of water up to the height of the waterfall. Each pump has a graph which show the flow rate at various height. We use these graphs (pump performance curves) to choose the most suitable pump rather than just looking at the nameplate flow rate and max head, that way we get a more accurately chosen pump. When our qualified and certified team size pumps we also take into account the length of pipe work, size of pipe, number of bends in pipe as well as height to water has to flow. This term is referred to as the total dynamic head (TDH). Total dynamic head refers to the pressure on a pump caused by the interactions of flow rate, pipe diameter, pipe length, elevation, and pipe material. Basically, it takes all those things into account and lets you know the limitation of your pump. TDH is usually calculated by a pond specialists and we are available to help you or your landscaper/architect calculate this figure in order to choose the best pump for your particular needs. Once we know the intended use of our pump we are able to choose the correct pump. Choosing the correct will also save you money by getting the most energy efficient pump. Don’t forget that many of our pumps have a 5 year warranty so a low energy efficient pump capable of running 24 x7 for 5 years is usually a cheaper long term option than running/ replacing a high energy pump. Lifetime cost is running cost plus purchase price, always best to consider the lifetime cost if you really want to save money. The higher the watts your pump uses, the larger the running costs, but you should also be aware that some pumps have a lower operating cost than others, whilst still be able to perform as well. For instance different pumps may be capable of a flow rate of say 3000 lph at 1m high, but you will find some pumps use less electricity to do that same job, and the pump that uses the less electricity will save you money on its lifetime running cost. Choosing a high efficiency or Eco pump is the best option as they use less power. Which Pump is best for your waterfall? Calculating the flow rate is probably the most important thing to do when it comes to your waterfall. For each 30 cm (1 foot) width of waterfall you will need a pump capable of pumping out 2,700 litres of water per hour at the height the waterfall is above the surface of your pond. So for a 15cm (6 inches) wide waterfall you will need 1,350 litres per hour or for a 60cm wide waterfall you will need 5400 litres per hour. These figures are based on a reasonably good flowing waterfall and can be increased for even faster waterfalls. Remember that these figures are the flow rate you need based on the width of the waterfall only and do not include the height of the waterfall. You will still need the same flow rate no matter how high your waterfall is but the higher the waterfall the larger the pump you will need. To make this simpler we have some tables here where the calculations are all done. Here we show you how you can create a small water paradise even where space is at a premium. Purchase half a wine barrel or similar container from your stockist, and the OASE Filtral 3000 UVC water feature filter kit (which has an integrated filter and 9 watt UVC) and also purchase a nozzle kit to go with it. The nozzle kit includes three conveniently changeable nozzle attachments that generate highly attractive water effects (Vulkan, Lava, and Magma). The filter unit ensures that the water is always clear. Summary: Minimum work effort for a convincing result, which by the way is virtually maintenance-free! Step 1. Set up the wine barrel at a suitable point and bear in mind that after it is filled with water it can only be moved with extreme difficulty. Place the »Filtral« on the floor of the wine barrel. Step 2. Fill with some washed pebbles on the sides. Use smaller plant baskets for planting as they prevent strong rooting plants from spreading. Step 3. It is best to place large plants in the plant basket on the long side of the Filtral in the rear area. 1. Dig a hole where the feature is to go, insert the reservoir and fill with water. Tip Ensure reservoir is level. 2. Attach one end of the hose pipe to the pump and lower into the water. 3. Feed the hose pipe from the pump through the hole in lid of the reservoir . 4. Feed the loose end of the hose pipe to the inlet at the bottom of the water feature. Lower the feature onto the lid of the reservoir. 5. Turn the feature on briefly so you can adjust the flow rate from valve on pump through the water feature, until you’re happy with the level of water flow. Tip ensure water flow lands on reservoir lid to minimise splash and avoiding water loss. 6. Once you’re happy with the position of the water feature, the reservoir lid can be covered with decorative pebbles or stone chippings to hide the lid. 7. Tip , Electrical wiring should be carried out by electrician and wired via RCD device. MORE TO FOLLOW , well try and add to this how to section regularly but don't hesitate to contact us for any information you need. Don't forget to check out our Frequently Asked Questions FAQ for more information.